One of the big advantages of having a lathe is being able to machine threads. 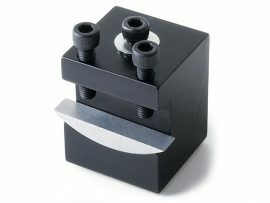 Many threads can be cut using taps and dies, but having a tap and die set that will enable you to cut all the non-standard thread sizes would be quite expensive. 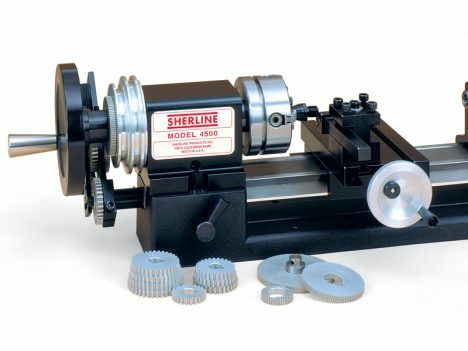 Sherline offers a unique and versatile thread-cutting attachment for its lathe. 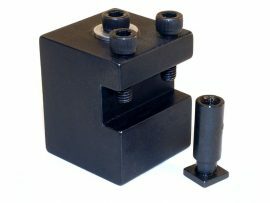 This low-cost attachment enables you to machine thirty-six different unified thread pitches (Pitch range from 80 to 5 threads per inch) and twenty-eight different metric thread pitches (Pitch range from .25 to 2.0 mm). It also allows you to cut them as either left-hand or right-hand threads. 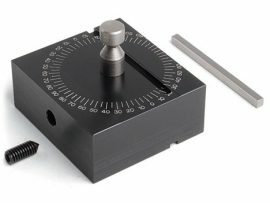 A 60° carbide cutting tool is included, but a standard high-speed steel lathe tool can be ground to cut various thread forms on any pitch diameter you desire. This versatility enables you to machine any inside or outside, standard or non-standard thread you might desire as long as it is within the size limitations of the lathe. NOTE: Lube up your gears well with light oil before using your threading attachment. Threads are generated on the Sherline lathe by gearing the spindle to the leadscrew. As the spindle is rotated with the handwheel mounted on the headstock spindle, the tool will advance an amount determined by the ratio of the gears. When the tool has completed its movement, you simply stop cranking, back up the tool and turn the spindle in the opposite direction until the tool is past its starting point. Then reset the tool and you’re ready for the next pass. It’s as simple as tapping! 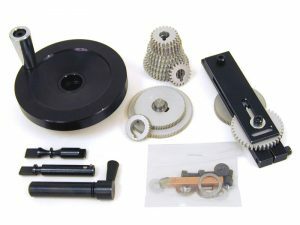 By using a 127-tooth gear (supplied), true metric threads can be cut on an inch (model 4000, 4500, or 4400) or true inch threads on a metric (model 4100, 4530, or 4410) lathe. 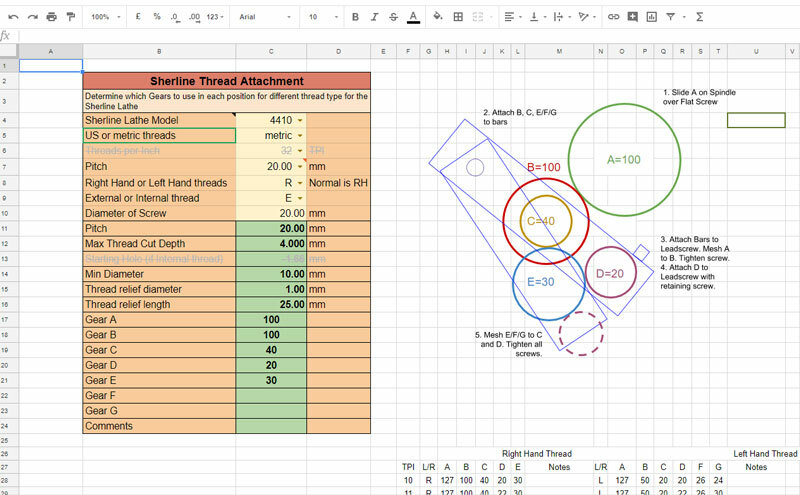 This Sherline Thread Attachment Calculator comes to us via Joo Beng Koh of Singapore. 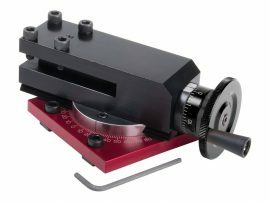 He originally posted it to the Sherline Lathe & Mill Facebook Group, and he has graciously allowed us to post his calculator link to our website. The calculator automates the gear selection based on the desired thread count. 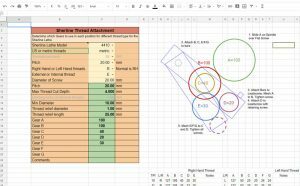 CLICK HERE for Joo Beng Koh’s Sherline Thread Attachment Calculator. Visit our Calculators page to download or link to other Gear Tooth and Thread Calculators. The page includes calculators for thread counts, helical gears, conversions, etc. Optional 24 Pitch gears are available for cutting odd numbers of T.P.I., where the last two numbers before the final zero(s) in the part number represent the number of gear teeth. Available are sizes 31210, 31230, 31250, 312700, 31290, 31310, 31330, 31350, 31370 and 31390.